During warm summer nights, an ancient ritual begins along the Pacific coast of the Baja California Peninsula. Guided by moon light and driven by pure instinct, a female sea turtle hauls her large, 60 kg body out of the roaring ocean. She crawls, slowly, to a sandy spot, near the base of rolling coastal dunes. She searches for the ideal place, sensing the perfect humidity and temperature for her offspring to develop. 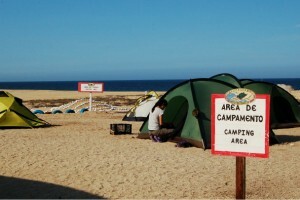 Only a few kilometers from parties in Cabo San Lucas, the quiet beaches are transformed into patrol zones. 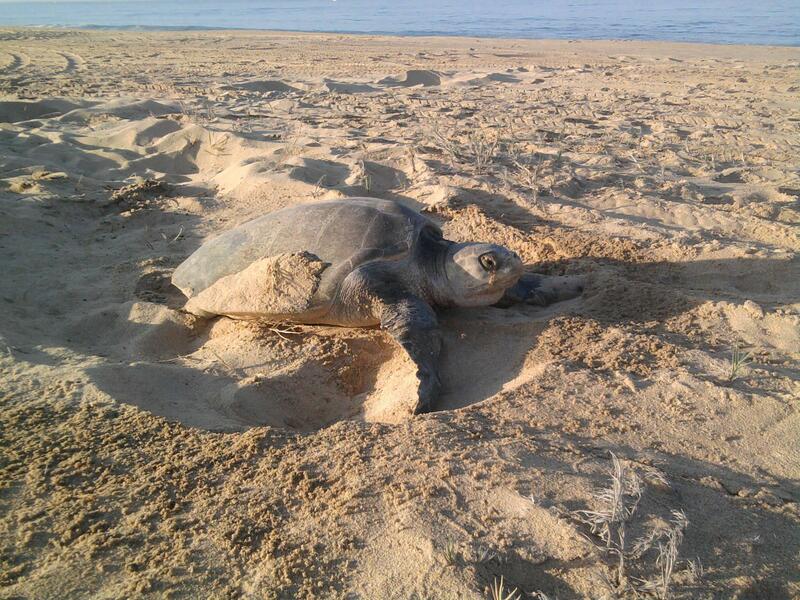 Biologists search for sea turtle tracks leading to a nest teeming with eggs. If the timing is right, they approach just as a female is emerging from the ocean. When she is spotted, biologists crouch down, ninja-style, and watch the event from a distance. After about 30 minutes, she camouflages the nest by tossing sand atop and finishes with a characteristic belly dance. When she is done, she heads back to the ocean. Faced with natural predators such as coyotes, crabs, foxes, and birds, the nest is vulnerable to attack. Yet, humans are the worst enemy. All seven species of marine turtles in Mexico, including the olive Ridley, are listed as En Peligro de Extinction (Endanger of Extinction) according to regulation, NOM-059-SEMARNAT-2010. Nesting populations of the olive Ridley are also listed internationally as endangered by the U.S. Fish and Wildlife Service (USWFS). There are three main reasons marine turtles are endangered: (1) turtles are incidentally caught in shrimp and fishing nets, (2) nesting habitat is destroyed for coastal tourism development, and (3) eggs and turtles are poached for food. Thus, nest monitoring is a scientific-based conservation tool to help increase populations. The nesting event is usually only witnessed by a handful of biologists. However, as educated tourists look for new activities and biologists look for funding, combining the two makes perfect sense. The mixture of tourism, research and education creates a new arena, termed “Voluntourism” where visitors are transformed into “Honorary Biologists.” Participants take part in all aspects of monitoring, learning about marine turtles and habitat conservation. Anyone with a permit can conduct monitoring, including non-scientists and even former poachers. However, tourism activities are not well regulated, and permits are not required for voluntourism activities. In February 2013, SEMARNAT developed a regulation (NOM-162-SEMARNAT-2012) to help protect, regulate, and manage marine turtle populations in México, which includes a specific monitoring methodology that must be followed by everyone. Olive Ridley species (Lepidochyles olivacea) are the primary nesting species in the region from July through December. Another species, the leatherback (Dermochyles embricada), also nests here, although, infrequently. The numbers differ greatly between the two species, ranging from 2000+ Ridley nests to less than 50 leatherback nests, regionally. The region provides primary nesting habitat for the olive Ridley compared to a secondary nesting habitat for the leatherback. The olive Ridley nests annually, compared to the leatherback which nests every two to three years. The overall population numbers of the leatherback is significantly lower than all other sea turtle species. While intentions of concerned citizens are valiant, concurrent science is vital for endangered species conservation. As voluntourism grows, local biologists are combining education, research, and tourism to form “Honorary Biologist” programs. For example, ASUPMATOMA, ProFaunaBaja, and Ecology Project International joined forces in 2011 to create a successful pilot program for local high school students. 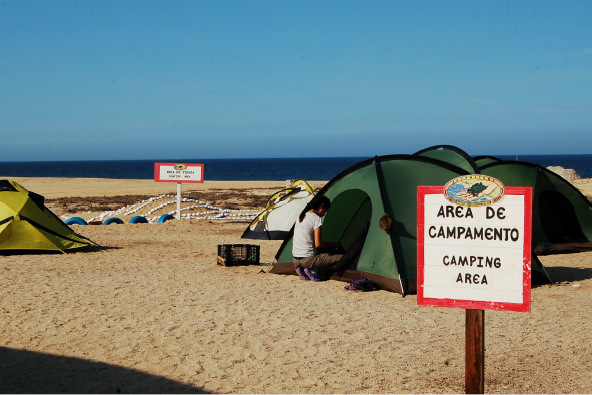 In 2012, over 60 local students from La Paz, Todos Santos, and El Pescadero participated in three-day workshops at an established turtle camp. In 2013, everyone is invited by to participate. The turtle camp is safe, quiet, complete with a solar-operated education center, designated tent camping area, community kitchen, and even bonfire pit, where visitors enjoy tasty smores before heading out for mid-night patrol. For more information on marine turtle conservation in Baja California Sur, please check: www.ProFaunaBaja.org or email Stephanie@ProFaunaBaja.org. Stephanie has been working as an ecologist for the past 15 years, specializing in biodiversity studies and endangered species habitat conservation. She also creates custom ecological curriculum for field-based student academic programs.